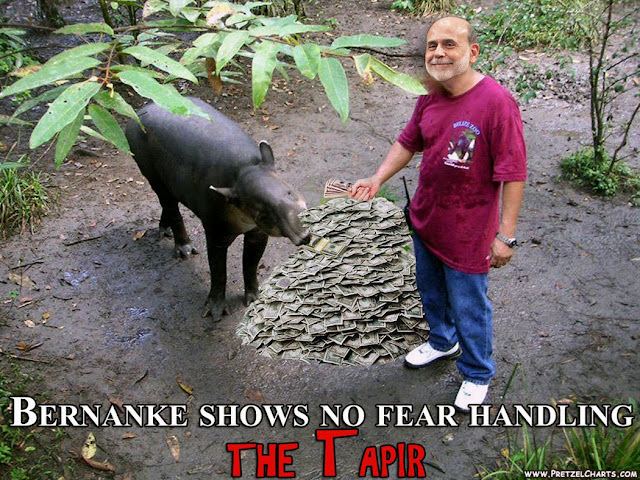 Pretzel Logic's Market Charts and Analysis: Bernanke Claims Investors Misunderstood "Tapir Talk"
Bernanke Claims Investors Misunderstood "Tapir Talk"
The big news since last update is, of course, the surprise announcement from Bernanke that there will be no taper of the QE program. This announcement came after months of "taper-talk" -- and burned investors who bet the market would decline as it was weaned off the Fed's bottle. On Thursday, critics blasted Bernanke for his lack of clear communication. Chris Low at FTN Financial was quoted as saying: "Despite Bernanke's effort yesterday in the press conference to paint the FOMC decision as entirely consistent with earlier communication from the FOMC, it was not... the Fed's communications credibility is shredded." My sources have provided us with an exclusive photo that helps explain the miscommunication. The problem stemmed from the fact that the words "taper" and "tapir" are pronounced the same, but have entirely different meanings. Bernanke communicated perfectly -- it was we who misunderstood. Taper means: diminish or reduce or cause to diminish or reduce in thickness toward one end. Tapir means: a nocturnal hoofed mammal with a stout body, sturdy limbs, and a short flexible proboscis, native to the forests of tropical America and Malaysia. When Bernanke talked about how to handle the Tapir, anxious bears simply heard what they wanted to hear ("taper"). After seeing this photo, I have to disagree with Chris Low -- the Fed's communication credibility is, in fact, wholly intact. If it weren't for the discovery of this honest miscommunication, one might have started thinking the Fed was actually trying to bait bears with all its taper-talk. Luckily there's no need to start any blindly speculative and completely unfounded conspiracy theories, since we now know that simply wasn't the case. Where does all this leave the market? Well, we're into territory where bears will need to make a stand fairly quickly. 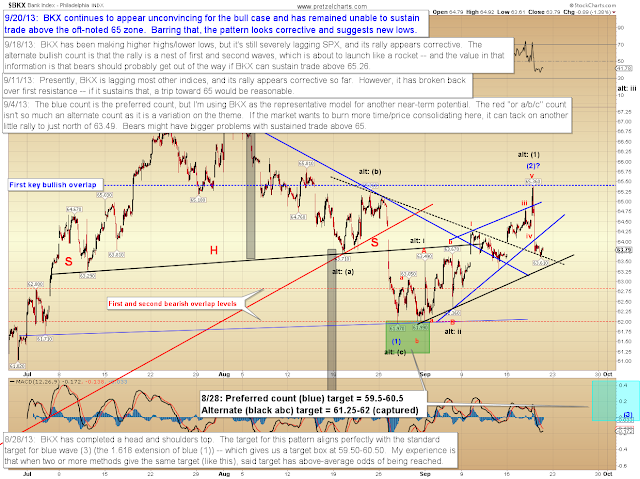 If this wave begins to appear that it's subdividing into a larger five wave form, we'll have to start giving serious weight to my (still alternate) big picture bullish count from February and its long-term target in the 2100's. It's worth mentioning that the fourth waves we've had to date have been somewhat pathetic -- typically we'd have expected a bit more downwards movement than we've had each time, and a couple have caught me looking (to borrow a baseball term). Welcome to the Fed's humbling New Normal, I suppose. 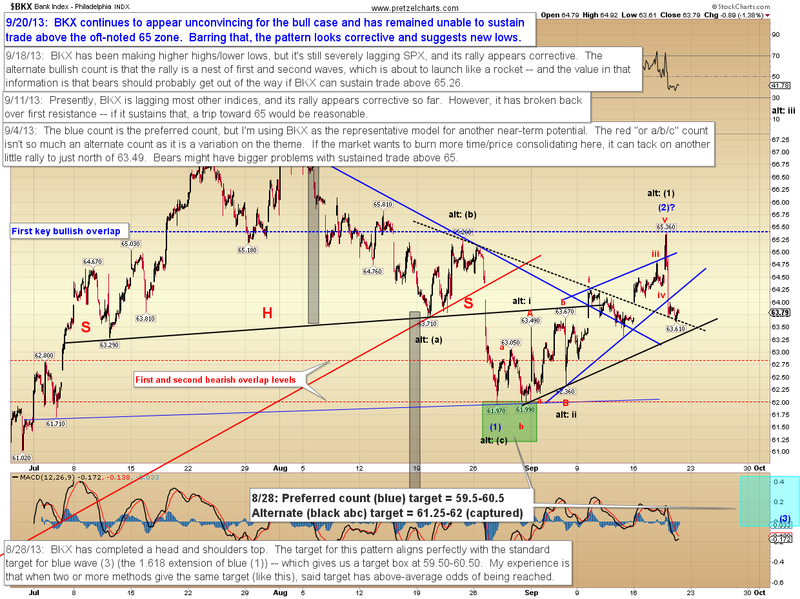 The hourly chart shows more detail. 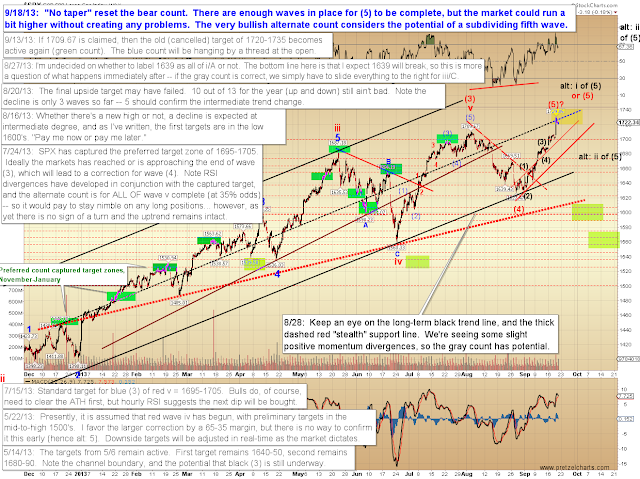 Frankly, it looks likely that there will be at least a bit more upside, but there are enough waves in place to count the last rally as complete. The Philadelphia Bank Index (BKX) continues to look uninspired, and is still keeping me from jumping on the "rah rah, we're going to the moon" bandwagon. A breakout over the key 65 zone could change all that, though. 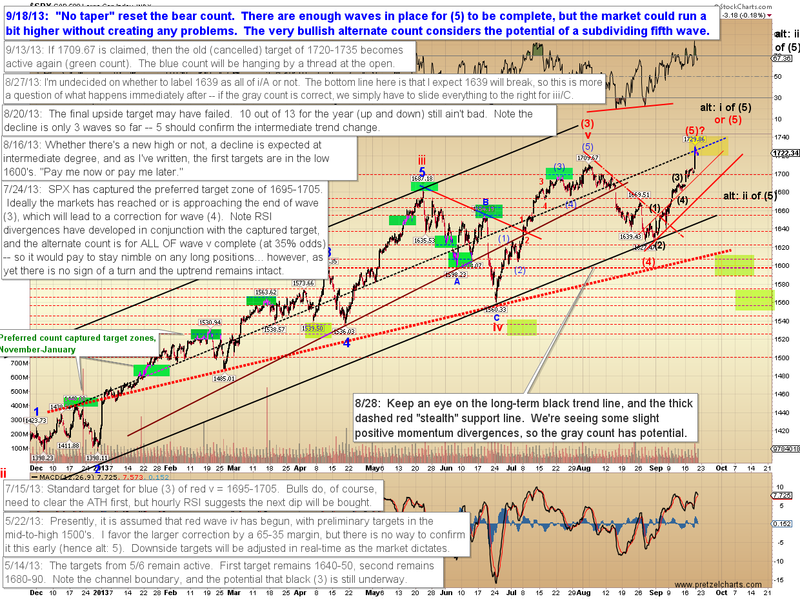 In conclusion, the intermediate term will hinge on how the market behaves in the directly upcoming sessions. 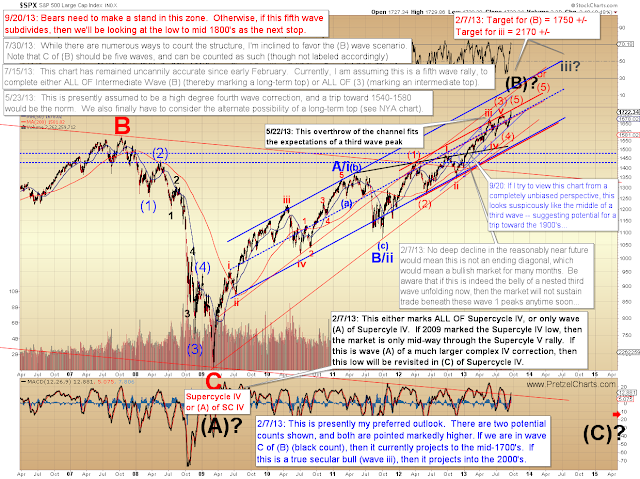 If the rally is a straightforward five-wave form, then it should be nearing completion. If it instead subdivides, the market will be off to the races again and headed for the 1800's. We'll have to see how the structure develops over the next few sessions. Trade safe. Thanks for the laugh Pretzel ! Haaa. Nice photo of the tapir you've got there!